Apple released the new iMac models yesterday. I've been waiting for this day since my iMac broke completely down in the end of February. So, naturally, I went right away to the reseller I've been buying my Apple products from and ordered a new one. I decided to go with the 21" model because 27" is just way too big. Even the old 24" one is a tad too big. The only thing that I hoped to upgrade and could not was the graphics. I would have liked to have 1GB of video memory, but Apple didn't offer that as an upgrade option for some reason. I decided to buy now anyway because I've been without a fully functioning iMac since October and I don't want to wait until next refresh. It is kinda odd to only get 512MB of memory in 21" iMacs because they offer the 6750M graphics card with 1GB of memory for 15" and 17" models of MacBook Pro. The same model with 512MB of memory they put in the cheaper 21" iMac. 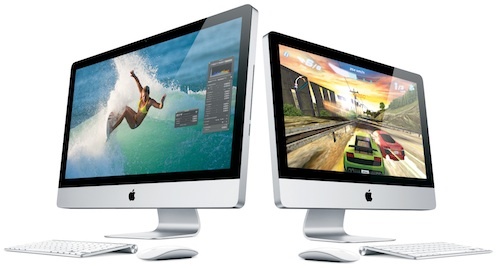 I wonder why Apple chose to not offer the 6770M model with 1GB of memory in the faster 21" iMac as an upgrade option. There's more space in an iMac than in a MacBook Pro, so the heat should not be an issue. In any case, I'll have plenty of juice in this sweet rig to do all that I want to do and WoW should run just fine, and even if I can't set the video settings to Ultra it'll still be awesome. This time I will not forget to buy the extended Apple care either. I planned to buy the extended care for my MacBook Air when I get my tax return, so I'll just buy one for the iMac at the same time.